We are proud to announce that the Cordillera Azul National Park project in Peru has been recognised by the IUCN Green List of Protected and Conserved Areas. The programme aims to encourage, achieve and promote effective, equitable and successful protected areas by highlighting examples of conservation of natural areas in practice. The IUCN Green List is an internationally recognised standard for how protected areas should be managed. 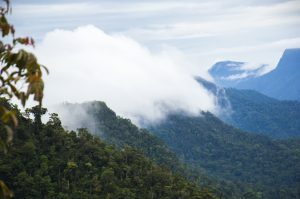 This designation endorses the conservation work of the Cordillera Azul National Park in the threatened landscape that the protected area manages. The Cordillera Azul National Park encompasses 1.35 million hectares with a buffer zone extending a further 2.3 million hectares, creating an area of 3.7 million hectares in a unique geological area where the Andes mountain range meets the Amazon rainforest. The Park was founded for two main reasons: to conserve the species, the ecosystems and the geological formations unique to the Park, and to promote sustainable development of neighbouring communities. Sadly, it is threatened by land-trafficking, logging, migratory and industrial agriculture and illegal crops. We are delighted that the successes of the Cordillera Azul National Park conservation model have been highlighted. Climate finance is addressing the causes of deforestation and supporting sustainable development on the ground. The collaborative model of protected area management has made large scale conservation possible where the private sector is providing funding to support local NGOs and the public sector. This announcement follows on from the naming of the Cordillera Azul National Park as one of 10 pilot projects in the IUCN Incubator for Nature Conservation in 2017, read more here.